Direct Diamond Center is a specialist diamond firm able to supply fine diamonds at competitive prices with lab certificates. We’ll help you understand the 4 Cs - color/clarity/carat weight & cut parameters - and enable to you to keep your diamond cost within your budget. 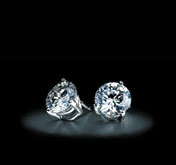 Call us today for diamond advice and help. Our wedding rings are made by fine jewelers skilled in the art of jewelry making. Our custom work uses state of the art CAD where necessary. Using our fine diamonds, we’ll create a beautiful wedding ring for your engagement. For diamond earstuds, pendants, anniversary rings or other gifts of diamond jewelry, consult us for quality pieces and great designs using carefully chosen fine diamonds. With nearly 30 years in the USA, Direct Diamond Center is able to satisfy your diamond and jewelry needs - for quality diamonds and jewelry, call or email us now.